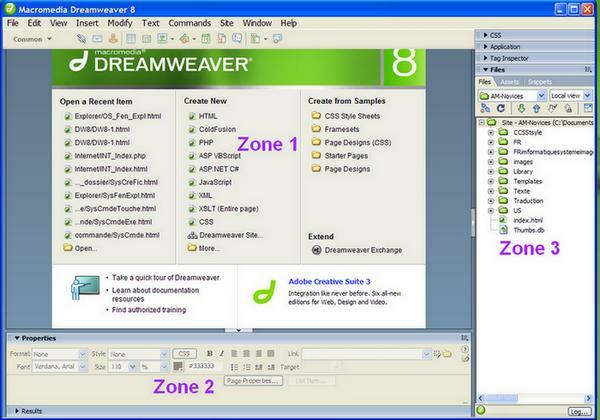 Dreamweaver 8 (DW8) is among one of the most popular programs that is used in the design and construction of web sites. DW8 was a Macromedia product, and has since been purchased by Adobe. To simplify things as much as possible, I will only cover the essentials that you need to know to create your web site. Before we start, you will notice that the Dreamweaver 8 window has 3 zones, and also a menu bar at the top. It is in this area that you will design your internet site. It will replace the intro screen of DW8. In this area you will find the properties of the items that you selected in Zone 1. In this area you will find all the functions that you can associate with your internet site. By following the next steps, I will show you how to design your web site, and how to use DW8. In this project we will limit ourselves to HTML, which is the most common code.